What elevation for spot forecasts? How can I check the elevation being used for a spot forecast, the one that displays below the map? The temperatures and snowfall forecasts in the meteograms absolutely do not correspond with the precip type and temp data displayed on the map, for the corresponding point on the map. Is this due to a wide grid being used? If so, it makes the forecasts very misleading for mountainous areas. the reference altitude (model's orography). Hope Ivo will include this in the next upgrade ! Let's take a look at the meteogram for Strassburg Airport (LFST), France. At "about location" section, we see the altitude: 146m. I believe this is the real height for the location and not the model's orography. Because whatever model I use, it stays the same. between ECMWF and GFS as these two models have different grid. The station's height (as displayed in the title) is 141m. as displayed in the title of the temperature panel. 6.5°K/km is the lapse rate for the Standard Atmosphere. we could adjust the temperature to the real height for a location. For mountainous regions it is very helpfull. P.S. I hope you understand what I tried to say. I'm not a fluent english speaker! if I change the zoom level on the map, then the spot forecast value changes. This makes it impossible to compare the map Fx with the meteogram Fx. if I click the spot location on a known 3000m peak, and then I change the elevation level for the forecast using the slider, I get different values for "Surface" and "3000m". Which elevation slider setting should I use for a forecast on terrain which is 3000m asl? I can find no consistent relationship. This makes it impossible to compare the map Fx with the meteogram Fx. Yes it is terrain elevation. No we do not adjust interpolated values to its terrain height (interpolation in between two model levels). @TZ did some coding in this field but not finished it yet. We do not have ANY METEOROLOGISTS in Windy team which is shame (the one I would love to have in team is Swiss), therefore we lack a knowledge in this field. If you have suggestions how to interpolate model's parameters to terrain height, please let us know. Send us some formulas to use or some document how to do it please. (if it is available in the Grib file) next to terrain elevation. Then, the "amateur forecaster" can correct the forecasted temperature using the Standard Atmosphere lapse rate. 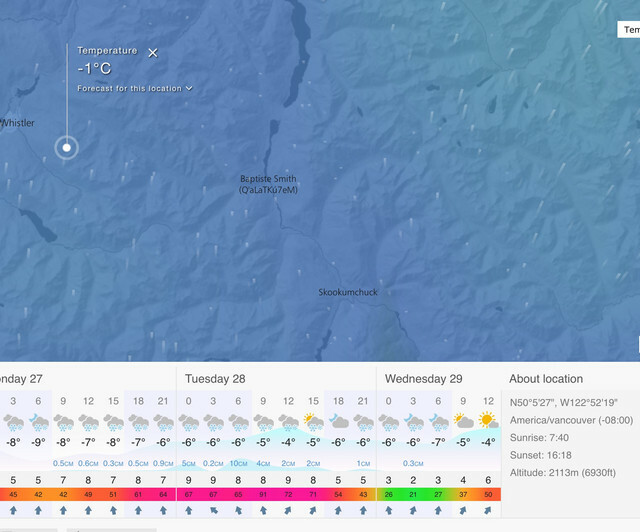 Example: I am on a ski resort with terrain elevation 2.000 m.
The model forecasts temperature +2 C and rain (bad news!). I can correct the forecasted temp (and turn rain into snow!). I know that the Standard Atmosphere lapse rate is 6.5 degrees / 1.000 m.
That equals to 3.2 degrees / 500 m.
So, I must subtract 3.2 from the forecased value (+2 C). (and the negative temp. indicates snow!). Thats why will snow although the model forecasts rain! Of course, in a relatively smooth terrain, if the difference between actual terrain elevation and model elevation is less than 150m, the temperature correction is only 1 degree C and it doesn't worth make such computations. Because valleys and mountain peaks are smoothed out by the model orography the direct model output of 2 m temperature may represent an altitude significantly different from the real one. A more representative height might be found at one of the nearby grid points. Any remaining discrepancy can be overcome by a correction using the Standard Atmosphere lapse rate or statistical adaptation (see Appendix B-6)." the elevation in "about location" of 2113m NOT the elevation for the meteogram forecast immediately to the left of that information? the meteogram forecasts do not adjust their values for elevation of the spot position on the map? the meteogram forecasts are based on a wide grid, which can result in a high peak displaying data for a low valley that falls within the same grid.